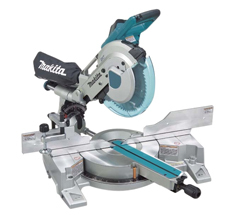 Are you looking for a 10" dual bevel sliding compound miter saw with great cutting capacity, and don't want to sell your first born to be able to afford it. The Makita LS1016 is probably the saw for you. Most of the specs are what you would expect from a 10" except for the large 4-3/4" vertical cutting capacity which is much larger then their saws previous 3-5/8". The LS1016 saw also uses a new rail system from Makita that uses 6 linear ball bearings that are said to deliver smooth, solid and adjustment-free accurate cuts. The four steel rails enable the saw to keep its large cutting capacity, but also remain compact. You can barely see in the photo that the saw has two lower sliding rails, and two upper sliding rails. This looks like a great new saw from Makita Tools, that is packed with a lot of features at a price that is still affordable. The only problem I see is the bevel being limited to only 45º on each side. When cutting large base on the flat, extra degrees past 45 are needed. I would like to see a bevel stop at 45º with the ability to go past.